With mountains of plastic gill nets strewn across its aft deck, the M/Y Steve Irwin could be a long-distance trawler at first sight. 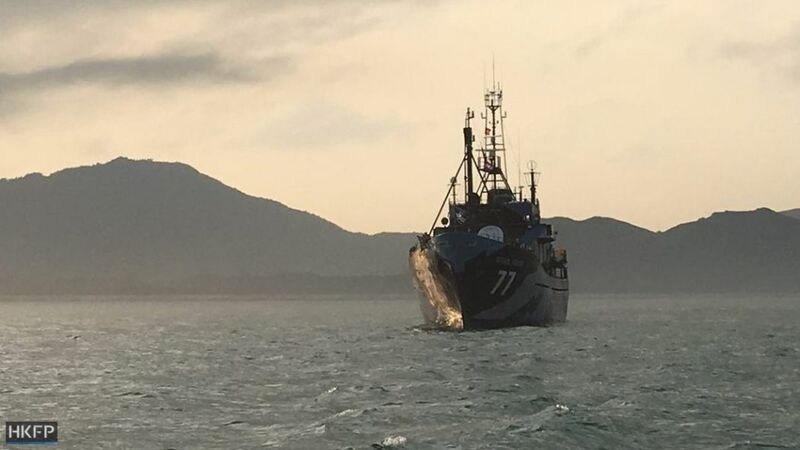 But the catch for this camouflage-coated ship anchored off northeastern Lantau are the fishing trawlers themselves. The nets it carries are the confiscated weapons of the illegal fishers they have foiled; more spoils of war than tools of the trade. Floating in Hong Kong waters for the first time in its history, this is the flagship vessel of the Sea Shepherd Conservation Society, an association of environmental activists who have made their name by actively—sometimes aggressively—confronting lawbreakers at sea. Greenpeace co-founder Paul Watson established the group in 1977, weary of lobbying governments to crack down on poachers and polluters and determined to personally stand in their way instead. Since then, Sea Shepherd crews have cut the nets of illegal fishers, rammed whaling ships, hurled butyric acid at the decks of their targets and used high-powered lasers to disrupt their bridge operations. Steve Irwin captain Siddarth Chakravarty. Photo: Ryan Kilpatrick. 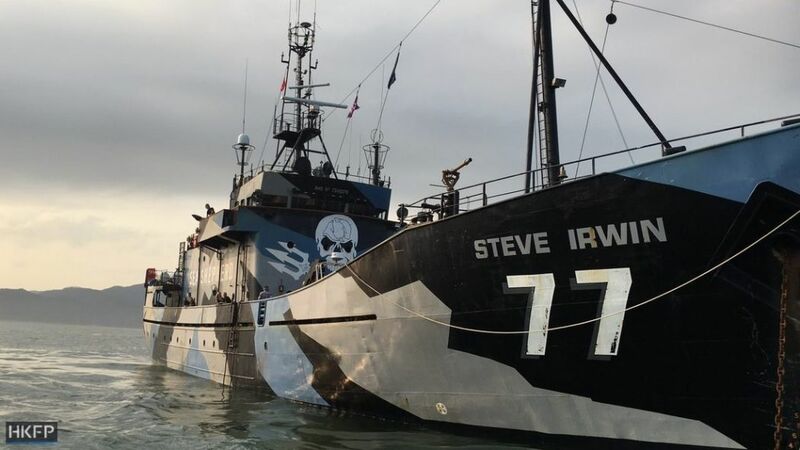 Named for the late Australian conservationist, Steve Irwin‘s latest campaign saw it chasing the Chinese-flagged Fu Yuan Yu 076 fishing trawler from the north of the Indian Ocean, where it was spotted using illegal and destructive drift nets in international waters, to the southern Chinese port of Zhuhai. Part of a small fleet referred to as the “Rogue Six” by the Sea Shepherd team, Fu Yuan Yu 076, operated by Fuzhou-based Dongxinlong Ocean Fishing, is not alone in proliferating illegal fishing practices among China’s one million-strong oceangoing fleet, as ships venture ever further from their country’s own over-exploited waters. As the Steve Irwin made its unexpected port visit to Hong Kong harbour, skipper Siddarth Chakravarty presented a cache of photographic and video evidence of the Fu Yuan Yu 076‘s illicit activities, which he plans to send to Interpol and the Chinese government. M/Y Steve Irwin. Photo: Ryan Kilpatrick. Despite an initially positive response from China’s Bureau of Fisheries however, “mixed messages” from domestic agencies have left him deeply uncertain about what—if anything—will happen to the Fu Yuan Yu 076 and her sister ships. The Steve Irwin’s surprise five-day visit to Hong Kong was a fitting conclusion to the 30 crew members’ latest, accidental campaign. “Operation Driftnet” began as “Operation Icefish II,” a sequel to the crew’s 2014-15 hunt for poachers of endangered toothfish in the high seas of the Southern Ocean, culminating in the longest pursuit of an illegal fishing vessel in maritime history. Guided to the southern Indian Ocean by satellite data showing suspicious activity, the team instead stumbled upon the Fu Yuan Yu fleet: six Chinese-flagged vessels deploying highly destructive and indiscriminate drift nets, a form of fishing banned on the high seas by a 1992 United Nations moratorium. As the ships, each named Fu Yuan Yu and numbered 071-076, abandoned their activities and scattered, the Steve Irwin gave chase, biting at the heels of the Fu Yuan Yu 076 as it steered a course back to Chinese waters. The two vessels became locked in a 5,000-nautical-mile race across both the Indian Ocean and the South China Sea, where the Fu Yuan Yu 076 quickly hoisted its flag and called upon the help of Chinese warships. The Chinese military questioned the Steve Irwin crew, but did not intervene. 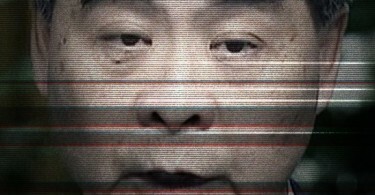 Nineteen days after the chase began, the Fu Yuan Yu 076 found safety in the southern port of Zhuhai, Guangdong province. Without a permit to enter, the Dutch-registered Steve Irwin maintained a three-day vigil at the port entrance before retiring to Hong Kong waters. The crew of volunteers aboard the Steve Irwin collected proof of 11 alleged violations of international regulations and Chinese law by the Fu Yuan Yu 076. Fujian officials have so far declined this material, stating that provincial-level authorities are not authorized to accept evidence offered by a NGO for use within the country’s court system. 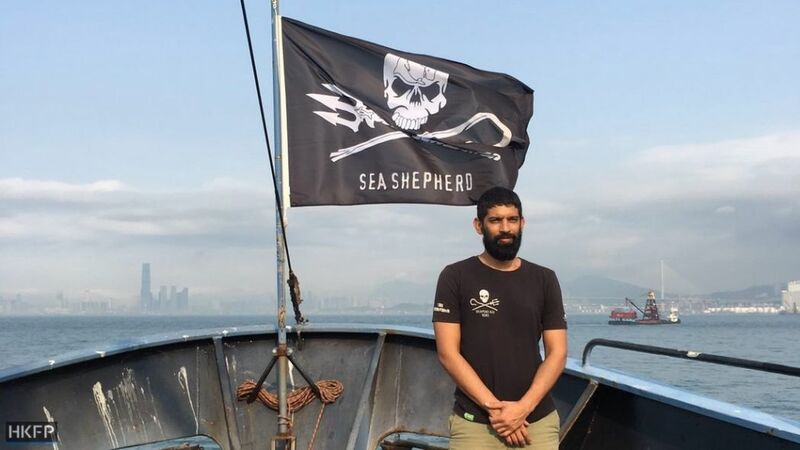 Chakravarty said he was surprised that mainland authorities even opened a line of communication with Sea Shepherd, when the Bureau of Fisheries responded the Steve Irwin‘s report of illegal fishing activity by Chinese vessels as they sailed into the South China Sea. Chakravarty said he received several emails from the Bureau assuring him that they were taking matters very seriously, and that they would be conducting their own investigations. “Either [the Bureau] is so sure that what they have is sufficient to go through with prosecution without [our] evidence, or they are choosing to let the evidence lie with us so they can get away with a weak investigation and the vessels can go out again,” he said. Flanked by the Western Pacific and South China Sea, China’s growing appetite for seafood—estimated by the UN Food and Agriculture Organisation to account for 40 percent of global consumption by 2030—has forced its fishers further and further from its own shores. Across the world’s oceans, China’s fleet of long-distance fishing boats, now the biggest in the world, has earned a reputation among conservationists for aggressive maneuvering, disregard for local and international law, and a high level of support from their home country’s coast guard and navy. In March 2016, Argentina sank a Chinese trawler that not only fished illegally in its territorial waters but then attempted to ram the coast guard ship trailing it. Weeks later, the Chinese coast guard engaged Indonesian patrol ships within Jakarta’s own territorial waters. This forced the outgunned Indonesians to relinquish a Chinese vessel caught fishing illegally in the Natuna Islands’ exclusive economic zone (EEZ), the sea area ascribed by the United Nations Convention on the Law of the Sea where coastal countries have jurisdiction over marine resources. 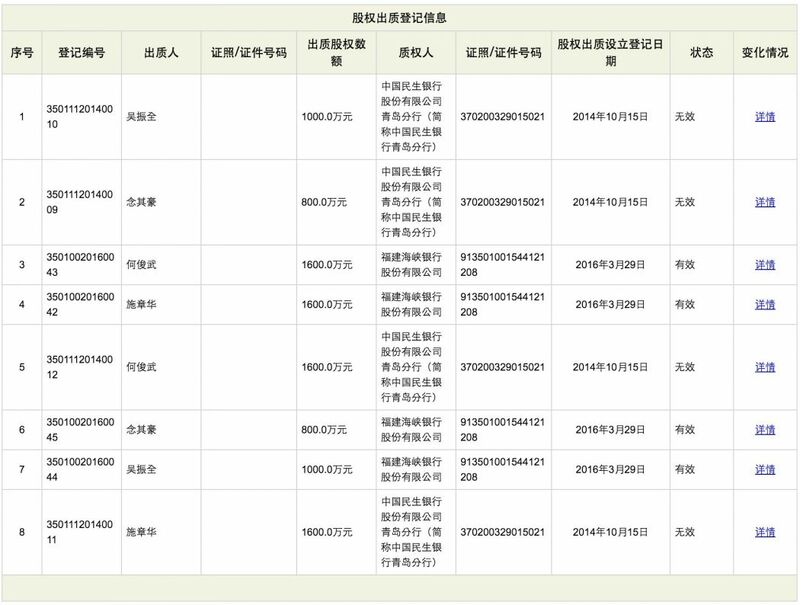 In the case of Dongxinlong, the activities of its Fu Yuan Yu fleet indicate that at the very least, there is a critical lack of oversight and enforcement in the fishing sector. How China makes headway in punishing those responsible for the Fu Yuan Yu fleet could be an indication of the country’s willingness to reign in the rogue behaviour of its ill-reputed fishing fleet. Graph showing subsidies from the government. In 2014, Dongxinlong received RMB 21 million from the Fuzhou provincial government as part of a municipal scheme to upgrade the city’s fishing industry. Government support for the expansion of deep-sea fishing fleets and overseas fishing bases was raised to national level in 2013 following the introduction of President Xi Jinping’s One Belt, One Road strategy to restore Beijing’s influence along the storied Maritime Silk Road. Graph showing lending records between the China Minsheng Bank in Qingdao and borrowers. The Fu Yuan Yu fleet, however, was observed by Sea Shepherd to be using banned drift nets in the southern and northern Indian Ocean. According to Chakravarty, the vessels were not even equipped for purse seining, a fishing method permitted by international law since it results in smaller amounts of bycatch and does not disturb the seabed. This is in spite of a promised “examination and verification process” that would “guarantee that funds are truly used for the construction of fishing vessels” and that the sums—amounting to RMB 650 million—would be paid out only after a three-tiered certification process. 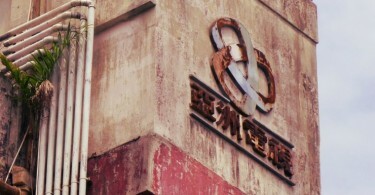 A year on from the implementation of the “Ten Measures,” the Fu Yuan Yu fleet continues to deploy destructive driftnet methods while Dongxinlong remains ensnared in legal proceedings with the shipyard responsible for the “Rogue Six” vessels over an undisclosed “lending dispute” between the two firms. As the Steve Irwin lay in Pun Shan Shek anchorage off northeastern Lantau, Chakravarty reflected upon the pursuit of Fu Yuan Yu 076, which he calls “a complete success” despite there being no official sanctions against the Chinese vessel. “If we hadn’t gone and highlighted the crime it would still probably be in operation, and we would have had another 100,000 sharks taken until now,” he said. Flouting international restrictions, Chinese vessels have continued to use drift-net methods in spite of international prohibitions. In doing so, Chakravarty estimates that the Fu Yuan Yu fleet snared 1,500 sharks per day alongside numerous dolphins and critically-endangered Southern Bluefin tuna. M/Y Steve Irwin. Photo: Ryan Kirkpatrick. Chakravarty said that Operation Driftnet represents a shift in outlook for the activist movement, as it concentrates less on vigilante-style methods and more on facilitating coordination between Interpol and national governments, ensuring that poachers caught red-handed at sea will face justice back on land. “We have moved on to doing things a bit differently now,” he said, noting that bottles of butyric acid and blinding lasers can no longer be found aboard the Steve Irwin. In the intricate tangle of overlapping jurisdictions that is the high seas, Chakravarty said that his organization’s mission has turned to highlighting areas where traditional law enforcement is failing, with a view to finding solutions. 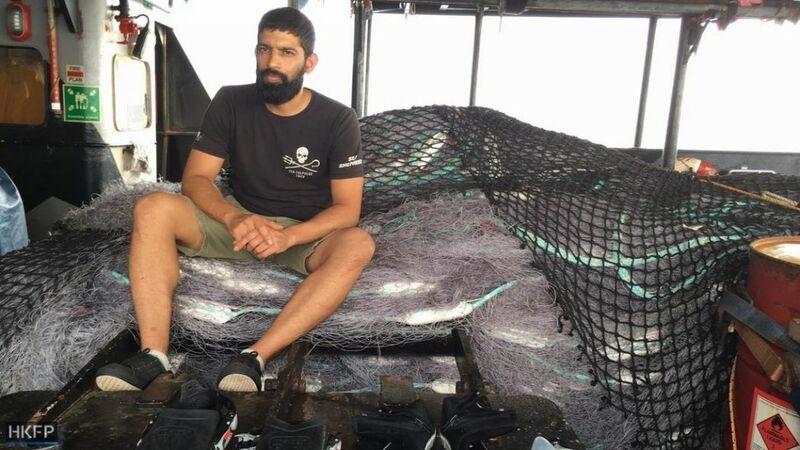 He expressed an interest in continuing to deter poaching there through future campaigns in the Indian Ocean, noting the region’s proximity to Sea Shepherd’s Australia-based ships and a recent resurgence in the use of drift nets. 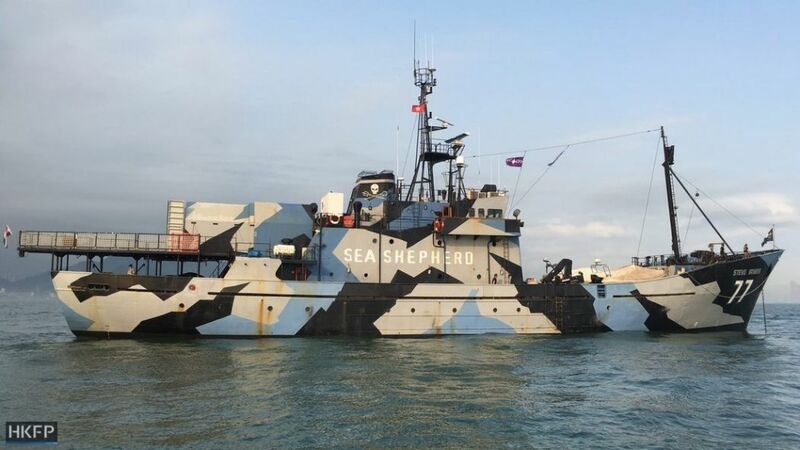 As the cost of keeping the M/Y Steve Irwin afloat begins to exceed the value of a new vessel, Sea Shepherd director for Asia Gary Stokes said that the former Scottish Fisheries Protection Agency patrol boat may not ply the seas for much longer. He estimates that within a few years the ship, which had already been laid up for disposal when Sea Shepherd purchased it, will finally be decommissioned and turned into a floating museum for the group. 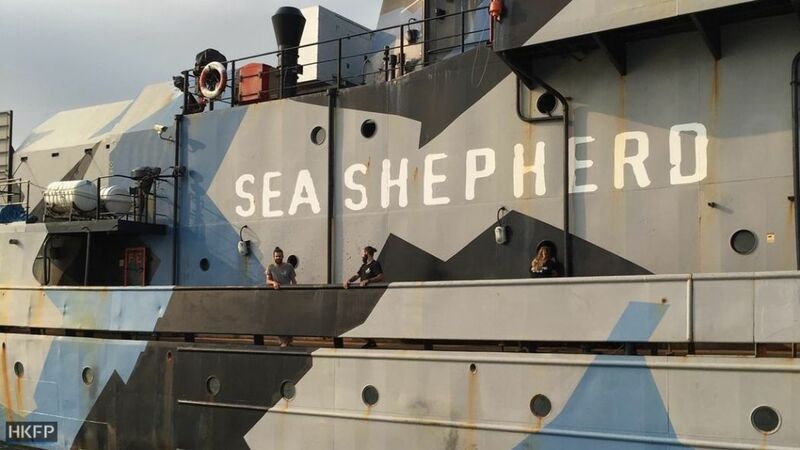 Sea Shepherd’s brief stay in Hong Kong was a first for the organisation, which on scheduled port calls will solicit donations from supporters ashore and invite local residents aboard for free tours. After five days spent refueling and replenishing supplies, the crew weighed anchor to begin the long haul back to Melbourne, Australia. 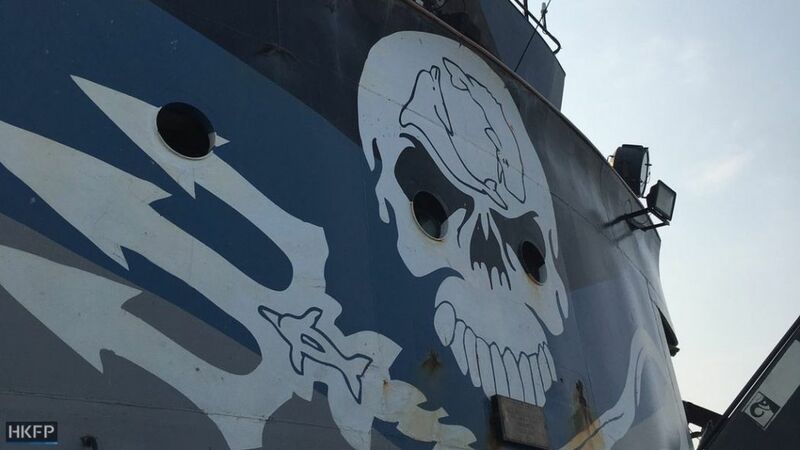 If the rest of the fleet continues Sea Shepherd’s mission to protect the Indian Ocean from poachers, however, this may not be the last time that the group’s distinctive skull, crook and trident flag flutters above Hong Kong waters.